Condemnation of blockade is nearly unanimous at global body. Today the General Assembly of the United Nations once again voted overwhelmingly in favor of ending the blockade of Cuba by the United States. 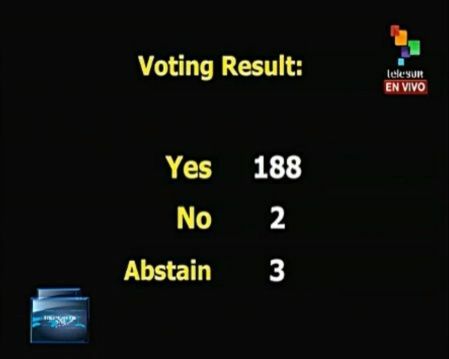 188 countries voted in favor of the resolution and 3 abstentions, with only the United States and Israel voting against it. The blockade is the longest in the history of humankind and has imposed economic, financial and commercial restrictions on Cuba for 50 years and was enacted as a tool for U.S. foreign policy to oust a government that it opposed. It has failed to do so and has only imposed harsh restrictions on goods that have a detrimental effect on the lives and health of Cubans. Representatives from the Movement of Non-Aligned Countries, the G77 + China, CELAC, Mercosur spoke on the topic at the U.N. today. The General Assembly also heard from several representative from individual countries throughout the world. The title of the document debated at the U.N. was “Necessity of ending the economic, commercial and financial embargo imposed by the United States of America against Cuba” and the topic has been debated at every session of the General Assembly since the forty sixth session. The blockade has been routinely condemned by leaders from throughout the world. In the last meeting of the General Assembly 188 countries condemned the blockade. Prior to today's meeting of the General Assembly, nearly 160 countries and international organizations sent messages calling for an end to the blockade. The New York Times editorial board has also recently come out against the blockade, current U.S. Secretary of Defense Chuck Hagel once held the position that the blockade should be lifted. Votes of the General Assembly are non-binding and the U.S. has historically ignored calls from that body to end its blockade. However the U.S. is increasingly isolated in its position vis-à-vis Cuba, a recent poll indicated a majority of U.S. residents support ending the blockade.